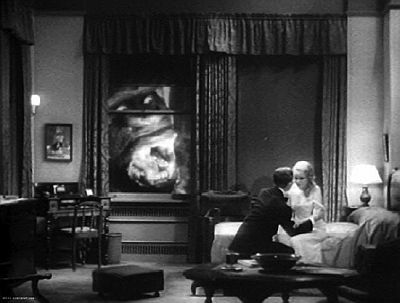 Around the age of ten or twelve I was struck more than anything by The Murders in the Rue Morgue, and the fear of seeing a gorilla appear at the window haunted my childhood insomnia for a long time (at the age of three I had been extremely frightened of a small marmoset which suddenly leapt up at the window; it is perhaps the only precise memory of my earliest years). This childhood memory of Jean Ferry anticipated strangely the experience of seeing King Kong, a film which should in later years by turns delight and horrify him. 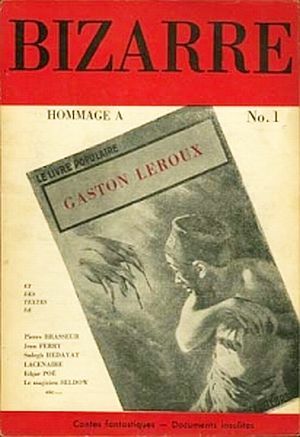 The text he wrote about this film for the magazine Minotaure in 1934 (translated by Paul Hammond for The Shadow and its Shadow) intrigued me by its notion that logical lapses could actually heighten the appeal of a film. To sum up, through the absurdity of its treatment (an inept script with numerous incoherent details), its violent oneiric power (the horribly realistic representation of a common dream), its monstrous eroticism (the monster’s unbridled love for the woman, cannibalism, human sacrifice), the unrealitiy of certain sets… the film seems to correspond to all that we mean by the adjective “poetic” and in which we had the temerity to hope the cinema would be its most fertile native soil. 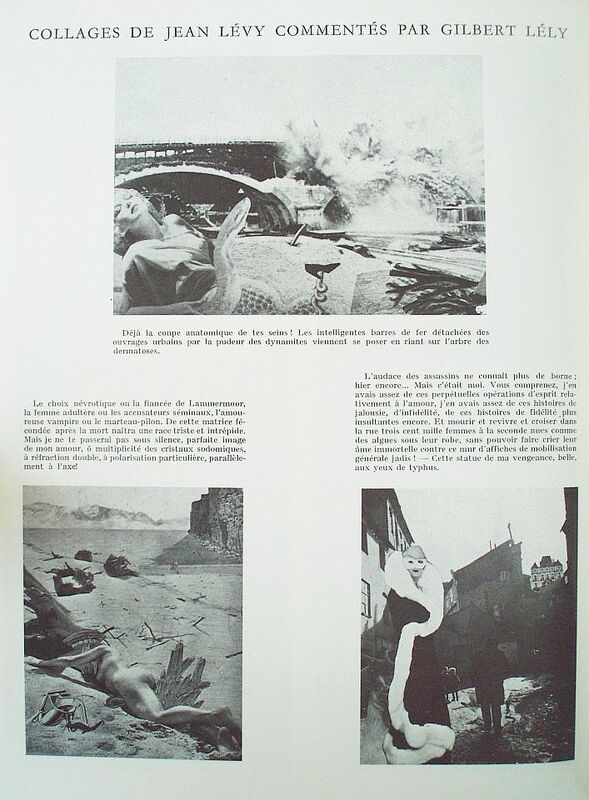 As I dug further into Ferry’s life I found out that he was very prolific as both screenwriter and participant in surrealist activities (click here to see 4 surrealist tracts signed by Ferry). But the conjunction of these was rather seldom in his career. Maybe that’s the reason why he is so underrepresented in film history as well as in accounts of the surrealist movement. Jean Ferry was born as Jean André Levy in 1906 in Capens (France). 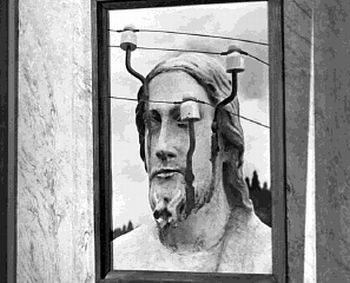 It seems that he was a natural-born surrealist as he was a nephew of the important publisher of surrealist works José Corti. After his studies in Paris he worked several years as a radio operator on a freighter of the merchant navy. In 1933 he began to participate in surrealism, but according to Eric Losfeld “he showed an ease in life that the other members of the (surrealist) group maybe didn’t possess”. At about this time he also joined the agit-prop-theatre groupe octobre which was largely dominated by the writing of Jacques Prévert. Ferry’s part was mostly that of an actor. His first job in the film business was as “chef de plateau” (a position comparable to a unit manager) for the Pathé-Nathan studios. Jacques Brunius, another surrealist filmmaker who was also hired in this function, hated it as it mainly consisted of writing reports about the occurences on the sets or as Brunius put it “industrial espionage” for the studio bosses. At the same time Ferry was also pursuing a career as a writer. During the occupation of France by the German troups he changed his birthname to that of his wife Marcelle ‘Lila’ Ferry, a flashy redhair and former mistress of André Breton, in order to conceal his jewish identity. Ferry was also a brilliant author of secondary literature. Among other things he was an eminent authority on absurdist writer Raymond Roussel and on genre writers like Gaston Leroux, Conan Doyle and Jules Verne. He was crucial in the foundation of the magazine Bizarre, in which would be published many of his articles concerning these issues. Around 1953 Ferry turned his back on surrealism to become a prominent member of the Collège du Pataphysique (if you follow this link, you’ll find many details of Ferry’s career in this organisation), which was founded in 1948. It is a sort of club whose philosophy is grounded on the “science of imaginary solutions” established by Alfred Jarry. Other interesting members were Raymond Queneau, Marcel Duchamp, Michel Leiris and Jean Dubuffet. His career in screenwriting spanned thirty-five years and comprised about fifty films of which many seem to be quite forgettable as they were mainly commissioned works. 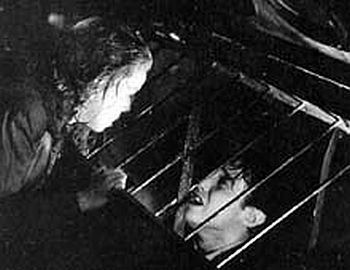 His first really interesting collaboration is that with Henri-Georges Clouzot for Quai des Orfèvres. Luc Sante observes that for a crime story “it has a flimsy plot, with far too many coincidences for the good of any story” and that the main interest lies rather in the “emotions of the characters than in fripperies of plot construction”. I assume that the unlikely coincidences are part of the Ferry-touch and intentional as Ferry’s literary hero Raymond Roussel also liked to (ab)use beneficent chance in some of his plots. Another collaboration with Clouzot initially became part of the surrealist film pantheon. Ado Kyrou termed Manon “one of the most dazzling images of mad love”. It is a transposition to a contemporary setting of Abbé Prevost’s novel Manon Lescaut. In this film… love overwhelms the protagonists in much the same way as in L’âge d’or. Manon is without redeeming qualities except when she surrenders to this love, while Robert seems devoid of character except when he is roused by it. Love acts on them to enable them to live beyond what they could otherwise experience, making them realize that the life offered to them is not the life they want. In 1953 he worked for Riccardo Freda and Mario Soldati in Italy. Spartaco aka Sins of Rome was a peplum and La provinciale an adaptation of a novel by Alberto Moravia. Interestingly, both were directors of films which were greeted enthusiastically by surrealists. Freda with L’orribile segreto del Dr. Hichcock and Soldati with Malombra. In 1956 Ferry wrote the screenplay for Cela s’appelle l’aurore together with Luis Bunuel. He came in as replacement for Jean Genet who had already collected his fee for the script but failed to deliver. Probably a project more personal for Ferry was Si tous les gars du monde as it echoes Ferry’s former job as a radio operator and the surrealist’s interest in world citizenry. La faute de l’abbé Mouret (1970) was an adaptation of Zola’s novel for Georges Franju. Among his last films are his collaborations with Belgian director Harry Kümel and I gather that these were the films were Ferry came closest to express ideas akin to these in his literary activities. Rouge aux lèvres aka Daughters of Darkness is a sensous vampire film with Sternbergian overtones. The script proceeds with comic-strip tableaux, frozen in their fetishistic splendour but also destroying whatever narrative coherence, if any, may have been intended. The excellent Esotika Erotica Psychotika recently wrote a post about the personal importance that this film has for him. …an old seadog (Orson Welles) who discovers the gods of ancient Greece, exhausted by centuries of neglect but still alive. He captures them and , with the help of a taxidermist, saws them into human skins. 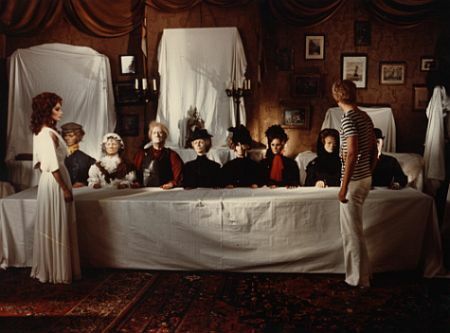 An adaptation of a novel by Hubert Lampo which was directed by Kümel for Belgian TV – De komst von Joachim Stiller (1976) – was to be Ferry’s last film. A project with André Cayatte which was never realized – because it was brought to a halt by the French ministry of justice – was about the Seznec affair. The alleged murder of Pierre Quéméneur (his body was never found) by his friend Joseph Seznec – who was found guilty and served 25 years in a bagno in French Guyana – was a case that created a huge scandal in France for years. Quéméneur was a politician and he and Seznec were involved in dubious business transactions with the Soviet Union. Fidelité – “a somber political crime story about the disappearance of a football” (E. Losfeld) – was a script which Ferry never intended to be made into a film. … he invites his readers to engage in a matérialisation intime, by projecting his characters and their actions on an inner screen. Despite his professional manner of presentation, Ferry does not delude himself. He does not pretend to be providing in Fidélité the scenario of a film we can expect to see one day in a movie house. This is a movie for the imagination, not for commercial exploitation. Jean Ferry died of heart attack on the 26th phalle of 101. # Bibliographie exhaustive de la revue Bizarre (en cours) ? Yes, I have. Believe it or not, today I wanted to inform you about it. I have updated André Breton’s Anthologie. Hold the linking for a while (I am, however, very flattered you have) because the format of the links will change.